When you think of signage, you’re probably thinking about outdoor signs. The types of things that grab the attention of passersby and bring them into your place of business. But there is an important next step to this: the moment those potential clients or customers enter your business. You can’t let that moment escape. You have to make an impression both outside and inside. That’s where indoor signage comes in. Once your outdoor signs have done the job of drawing business in, your indoor signage needs to continue to build your brand, welcome, and guide. Your indoor signage takes the brand that your potential customers recognize from your outdoor signs and bring it into your workplace. This provides a seamless brand that will make your potential customers feel familiar with your space. This will also show that you take your business seriously. This seamless branding provides a confident and professional image that will impress those who visit. This first impression is immensely important. Your indoor signs also welcome visitors and guests. When someone walks into your space and sees your name after seeing it outside, they know they’ve found the right place. This will take some stress out of the equation and welcome people into your space. Couple this welcome with a physical one from yourself or an employee and you have an excellent impression that will help people trust you. 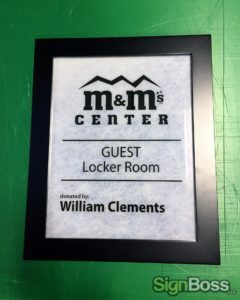 Indoor signs can also help guide your guests around your facility. Signs can help point the way to and from a reception area, between departments and offices, to the restroom, elevator, exit, or another vital part of your facility. These wayfinding signs can make your facility much less intimidating to visitors which means they’ll be more inclined to work with you. Indoor signs not only guide but can help label these important areas. A branded sign over the receptions area, or a specific department can make it that much easier for someone to find. 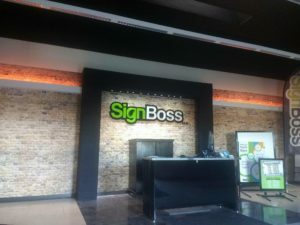 If you’re interested in indoor signs, SignBoss can help. We have a huge selection of sign types that can help you make your indoor spaces work for you. Feel free to get in touch and discuss your needs, and we’ll do our best to help you find the best signs for you!